Being creative is often a matter of making connections or links between seemingly unconnected ideas or things. Where do you find inspiration for connective creativity? For me, travel always primes the pump. We recently visited the Pacific Northwest. If you follow me on Instagram, you may have seen a few of the photos I took while there. The mountains, the rose and dahlia gardens, the Columbia River gorge vistas, all inspire me. 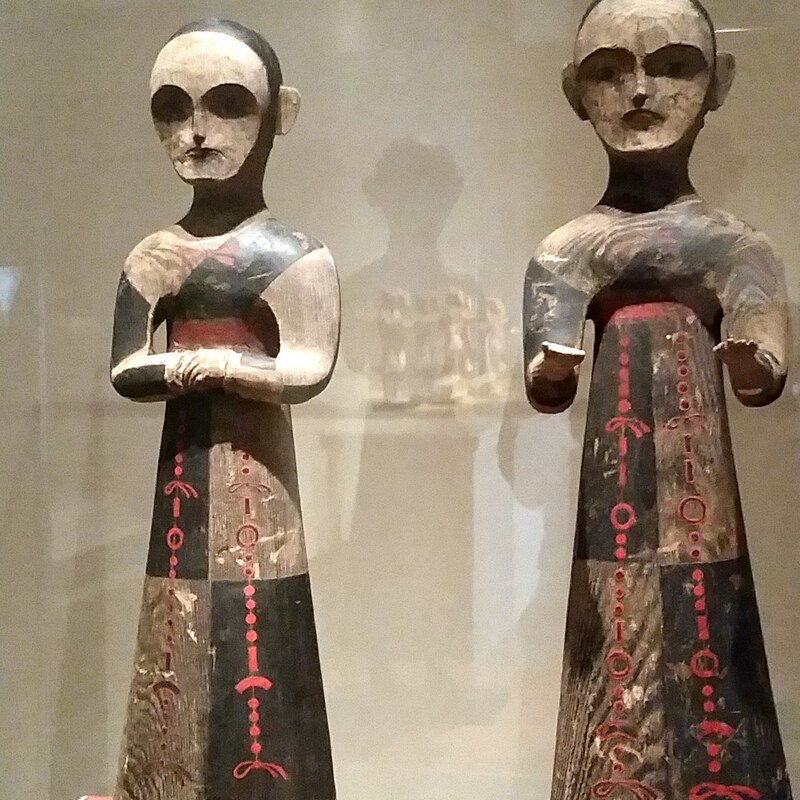 What took my fancy most, from a quilting perspective, were two figures I captured at the Portland Art Museum. They are shamans from ancient China. Unfortunately, I didn’t photograph the tag, so I don’t have more information than that. It’s easy for me to imagine these beautiful cat-like faces portrayed in quilts. Even their robes are suggestive of patchwork. Generally, though, I don’t need to travel as far to find interesting ideas. Recently Jim and I were in a hardware store. I wandered the aisles as he looked at eye-hooks and carabiner clips. In the ropes-and-lines aisle, I found something called “mason line.” Certainly I’m familiar with the Mason-Dixon line! But this was new to me. Mason line (or mason’s twine) is a nylon braided twine used in masonry, brick-work, and concrete applications. It comes in amazing colors, like fluorescent green, bright orange, and hot pink. They’re about the weight of a hefty perle cotton thread. I haven’t done any couching, but I could imagine using mason line as a couching or decorative thread on … something. Nature is always high on the list for sources of inspiration. It has all the components artists love: color, value, shape, texture, line, as well as balance, proportion, movement… Besides nature, and of course current day artists and quilters, where do you find inspiration? What leads you to those creative leaps that feel completely new? Let’s make a list. * books about … what? What can you add to the list? What quilting or art have you done with unusual sources of inspiration? Tell us about it in comments. This entry was posted in Quilting and tagged Inspiration on July 30, 2018 by Melanie McNeil. There’s a new skirmish in the quilting community. Apparently the admin for a Facebook group used tutorials and patterns created by other people, without attribution. When challenged on it, she kicked the complainers out of the group and made the group private. Stealing is wrong, and though I don’t know the details of this story, it sounds like the admin did the wrong thing. A couple of bloggers/quilters I respect have written about the incident and how to avoid copyright infringement. (See Sam Hunter’s post and Lori Kennedy’s post.) I’ve written about it, too, with some different links and thoughts. Since the last time I posted about it was a couple of years ago, I’ve updated that information below to provide it again. The essay was published in Robert Fulghum’s book All I Really Need to Know I Learned in Kindergarten. I am using this excerpt based on “fair use” rules for copyright. Honestly, we don’t share everything, but I know bloggers and crafters are incredibly generous. Mostly we don’t hit. And as to messes, what happens in your studio should stay in your studio! But there are three things here I think we should take seriously. One is playing fair, and one is not taking things that aren’t yours. 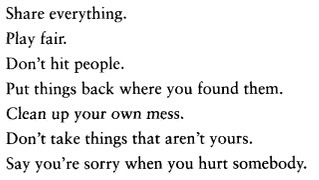 And when we do mess up, we should apologize. I see two separate areas of trouble when it comes to playing fair and giving deserved credit. One is for bloggers, and the other is for quilters and crafters. Obviously the two groups overlap. Sometimes, in enthusiasm to share cool stuff and brilliant thoughts, bloggers use work that is not their own. 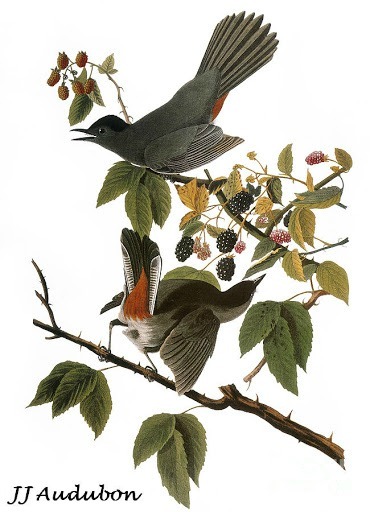 Using information from other people might include photos, words, charts, tables, logos, or illustrations. The easiest violation is with photos. I wrote some about this earlier this year. Ethically, using someone else’s work without crediting is taking something that’s not yours, and it’s not playing fair. Ask yourself how you would feel if a photo of your quilt appeared in various blogs, but the bloggers didn’t have the courtesy to credit it with your name, or a link back to where they found your glorious quilt. Or even to ask permission to use the picture. If you’d like more information on posting other people’s content appropriately, see a really helpful post from HubSpot Blogs. It is on citing sources and not stealing other people’s work on the internet. When it comes to creating tangible (rather than digital) work, there are other ways to take things that aren’t yours. Here again, there are obvious (I hope!) examples of wrong-doing, as well as others that might seem more grey. First, a lot of people see no harm in copying a pattern that someone else purchased. If your friend buys a pattern and you want to make the same thing, you can just make a photocopy or scan of hers. In fact, your whole bee or swap or small group can have copies, too, right? But there is harm, as it deprives the creator of pay for their work. Imagine working — many hours of effort — to create a product for sale. Imagine someone taking it without paying for it. That is stealing, plain and simple. Sam Hunter wrote about this better than I can. When a friend-of-a-friend stole one of Sam’s patterns rather than paying for it, it created a sticky situation, to say the least. And remember, this isn’t true just of patterns that you buy one at a time. It also counts when you didn’t buy your own book or magazine patterns, but photocopied someone else’s instead. Now comes the harder part, the grey area. Now also comes the caveat. I am NOT an attorney and am not providing legal advice. Most of the information provided below is based on two posts by Jen Bernstein. [Links below.] She is an attorney, but she also is not providing you legal advice. If this is an area of concern for you, please retain your own attorney. The design (what a quilt or project looks like) and the pattern (instructions of how to make it) are separately copyrighted. So let’s say you see a quilt and don’t want to buy the pattern. Instead you spend time figuring out how the block is made, how many of them there are, and how big they likely are based on the size of the original. You draw it all out in EQ7 to get your layout and fabric requirements. Ta-DAH! It’s all good, huh? Well, maybe not. Depending on how closely “your” design matches the original, you may have infringed on a copyright. For more information, see Jen Bernstein’s guest post “Can You Copyright a Sewing Pattern?” on Abby Glassenberg’s While She Naps blog. Don’t take things that aren’t yours. That’s the legal part of this. Now I’ll return to the ethical part: play fair. To me that includes acknowledging others for their inspiration and contribution. That might mean literal acknowledgment in blog posts and Instagram and pins, or on labels. Some people say when you label your quilts, you should include the pattern and designer’s name, or the source of inspiration. I’m not likely to put that stuff on labels (I design my own quilts), but I agree with the intention. Or it might just mean having an attitude of gratitude when we create. None of us is the first ever to make a quilt. That happened thousands of years ago. Regardless of how original we think we are, how fresh our designs, we were inspired by something. Even if we are “self-taught,” likely that means learning from online sources or books, which someone else wrote and made available to us. We should be proud of ourselves and our work — we do amazing things! But we can be humble enough to feel gratitude for those who came before us, and for those who work by our sides. This entry was posted in Blog, Creativity, Quilting and tagged Attitude of gratitude, copyright, Giving credit, Inspiration, Patterns, Photo credits, Quilt patterns, Robert Fulghum, Sam Hunter, Saying thanks, Thank you, Tutorial, Tutorials on August 2, 2017 by Melanie McNeil. It’s been rather a slog, but I’ve finally finished the top of this quilt. In general, construction was pretty simple. The delays came in decision-making, especially for the corner blocks. After originally considering making each corner different and including my initials and the year, I decided to make them the same. My first impulse there was to use Ohio Stars. I thought this would work well for style, and it would be a reference to the IQSCM’s belief that the original quilt may have been made in Ohio. I made a test block with an Ohio Star and wasn’t happy with it. I liked the way the star points repeated the hourglass construction of the first big border. However, somehow it just looked like too many small pieces. After trying a few other designs in EQ7, I chose the modified variable star to center my blocks. It actually uses the same shapes as the Ohio Star but in different proportions. As I said to Jim, I can’t define why I like it better, but I do. I’ve asked a talented, professional longarm quilter to quilt for me. This piece deserves better quilting than I can do myself. In the meantime, I have plenty of other things to work on! 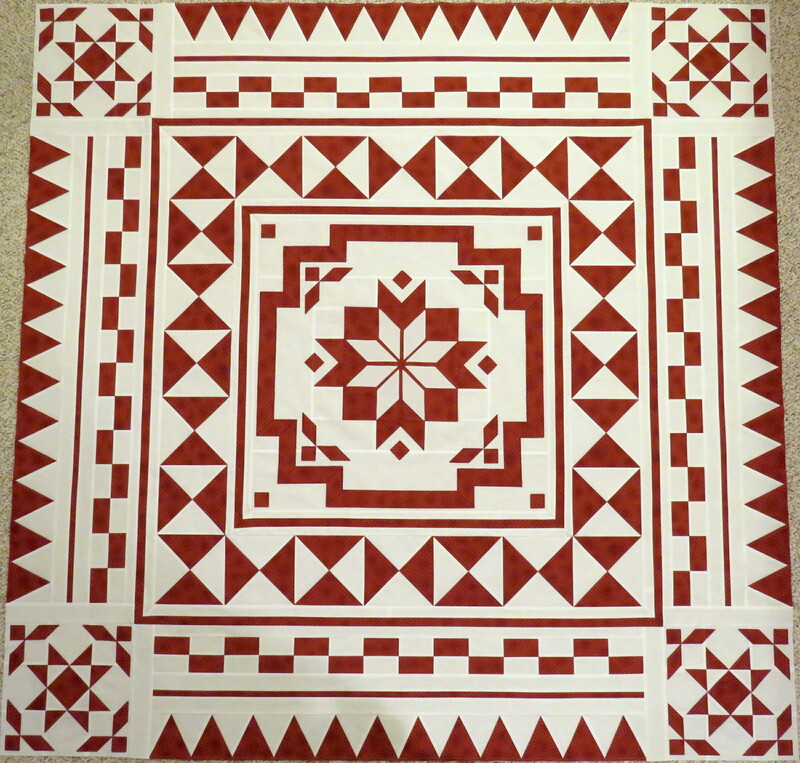 This entry was posted in Medallion Quilts and tagged Historical quilt, Inspiration, International Quilt Study Center & Museum, IQSCM, Medallion quilts, Process, Progress on March 23, 2017 by Melanie McNeil. As discussed before (here and here,) I’m creating a quilt inspired by a historical work held by the International Quilt Study Center & Museum. You can find the inspiration quilt here. And you can find more information about it here. I’m not reproducing the original quilt, but trying to honor it and its maker. In so doing, I’m changing some aspects of the design. The size is somewhat smaller than the original, as mine will finish at about 68″ square, while the original is listed as 79″ x 81″. Also, I don’t have a pattern so my proportions are somewhat different as I estimate from the photo. And I’m changing the center block and corner blocks, while maintaining the feel of the original. Because of the construction challenges this project offers, I’m building it in parts. Here is a photo of the “parts” so far, laid out on my beige studio carpet. The places where the carpet shows are where more parts are needed, such as for the big corner blocks. If you’ve ever used traditional piecing to make long strips of triangles for a border, you know it is fraught with lots of opportunity for error. I used my new paper piecing skills to make mine. While the process is slow and fussy, and wastes fabric and thread, it is easy enough and created borders I’m really happy with. I’ll take the waste and the pace in exchange for the quality. For those corner blocks, I’m considering including my initials in one and the year in another. However, that leaves two more blocks and I’m not sure what to use in them. Any ideas? I’m really excited about this quilt, as I’m able to honor an amazing piece of art that’s 200 years old, and its artist, while contributing my take on the design and incorporating some new-to-me techniques. 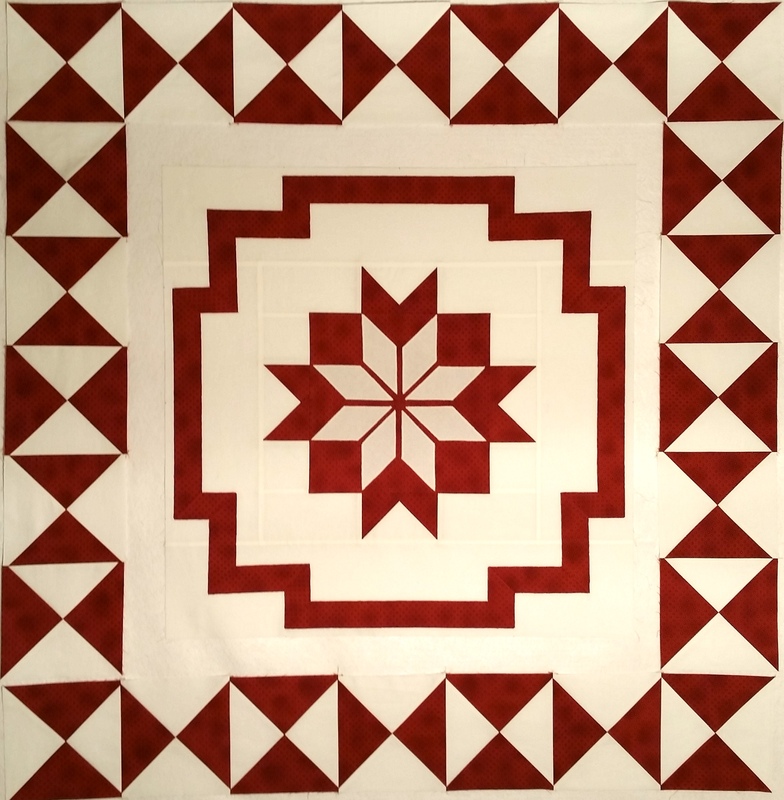 This entry was posted in Medallion Quilts, Quilting and tagged Historical quilt, Inspiration, International Quilt Study Center & Museum, IQSCM, Medallion quilts, Process, Progress on March 5, 2017 by Melanie McNeil. As mentioned in my last post, I’m creating a quilt inspired by a historical work held by the International Quilt Study Center & Museum. You can find the inspiration quilt here. And you can find more information about it here. I don’t intend to reproduce it exactly, but to honor it. The center block of the quilt is quirky and complex. I found the inspiration quilt more than a month ago and have spent much of that time pondering its construction. The sizing of components and the technique to use for them both present challenges. (And opportunities!) On first glance it looks mostly pieced, but I decided that appliqué would be my primary technique. I’m not very experienced with appliqué, so thinking it would be “easier” gives you a notion of how the piecing would go. And because I don’t appliqué much, I tried multiple methods before settling on raw edge fusing, with a button-hole stitch to seal the edges. Here’s the block so far, with more detail to come. It is surrounded by the hourglass blocks that border it a little later. I have a ways to go yet, but I’m really happy with it and its resemblance to the historical quilt. 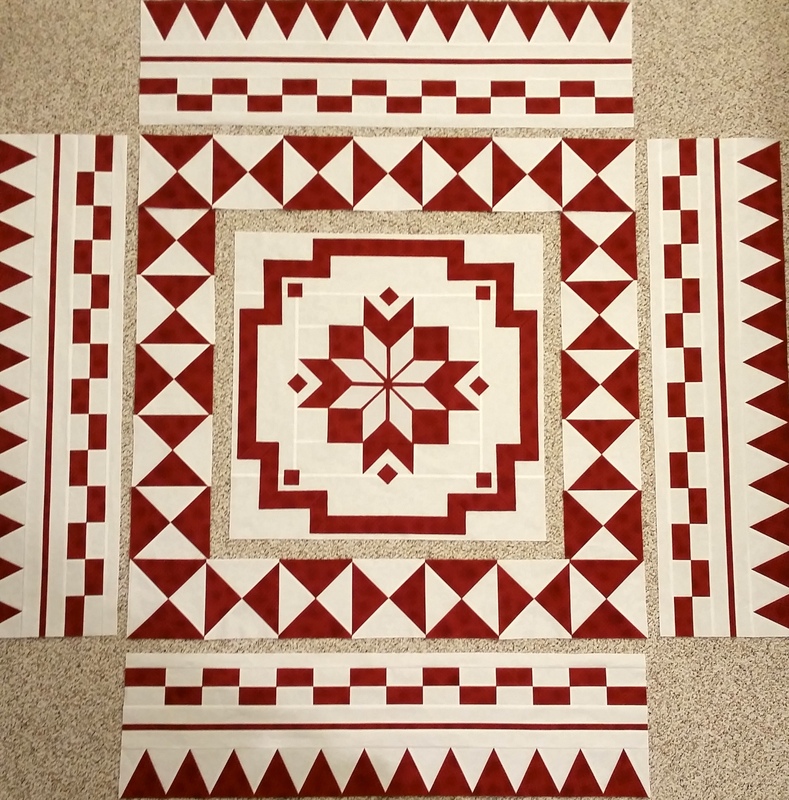 This entry was posted in Medallion Quilts, Quilting and tagged Center block, Historical quilt, Inspiration, International Quilt Study Center & Museum, IQSCM, Medallion center block, Medallion quilts, Process, Progress on February 26, 2017 by Melanie McNeil.